I often get asked about hotels because I’m slightly obsessed with them. I am surprised when people just book a hotel at the going price and accept a room near a noisy elevator. The thing with hotels is it is a kind of dance between you and the hotel: You are paying for an experience; they are taking your money and providing you with that experience. I can honestly tell you that you can often have a better hotel stay if you befriend ‘your’ staff while staying in ‘their’ house. If you think of it this way, as a house guest, you’ll be more bold in asking your hosts for a few extra things to make your stay in their house memorable. I escaped to one of my favourite old hotels this weekend, which we Vancouverites call the ‘Hotel Van’, that is managed lovingly by Fairmont Hotels and Resorts. I stayed on the Gold Floor (only because I have a friend who kindly gave me a friends rate, thank you RB). I do highly recommend the Gold Floor for an escape from reality, even 24 hours there feels like you’ve really been on a holiday from the toils of life. Restoration in small bits is all I can manage with my hectic schedule I’m afraid. 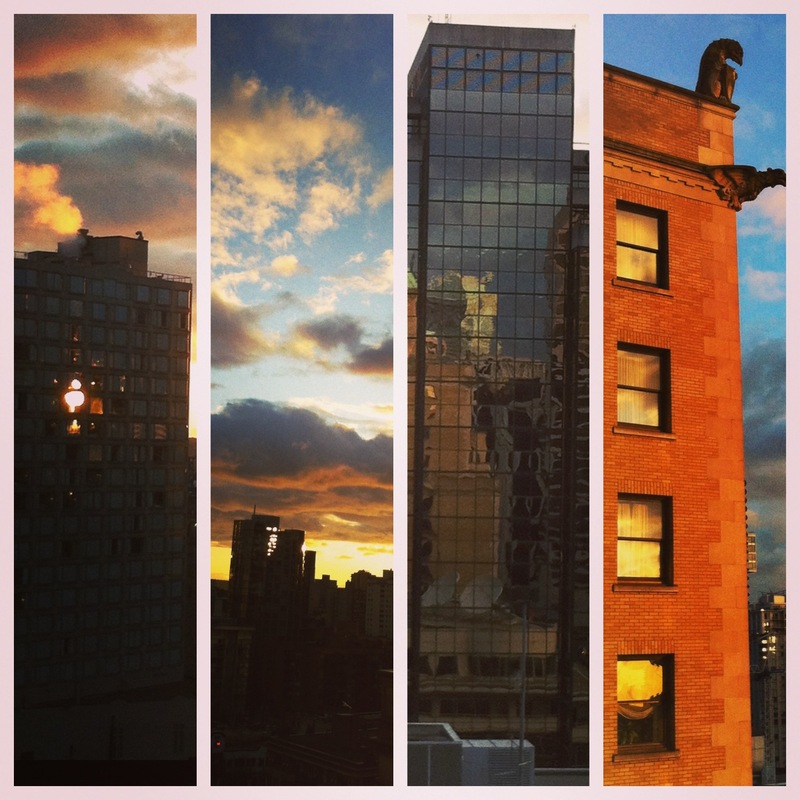 View from the 9th floor. Note the Gargoyles in the far right picture. Love them! Since my friends asked, I thought to share a few things you can do to be a good guest and have a better hotel experience. 1. Ask that your details be kept on file if possible. This way, as a returning guest, they already know that you want. 2. When you book, don’t just leave it as an online transaction. Talk to your hosts. Call them up. Say, look, I’m neurotic (that’s how I start anyway), I can’t be anywhere near a service elevator or elevator, screaming baby or newlyweds. In fact, any couples at all. Okay, I’m joking about that part but as a single, well, you know what I’m getting at here I hope. 2. Ask for an early check-in. For example, I arrived at 1 pm versus 4 and got in an extra 3 hours of writing! 3. Ask for a late check-out. I left at 1 pm versus the wretched hour of 11 am which won’t do at all. 3. Ask, if possible, for a hypo-allergenic room. These rooms are likely the newest rooms in the hotel and I’ve found them to offer a more peaceful sleep with less of the ‘hotel’ stuffiness in your head that you might suffer if you are an allergic type like me. 4. Ask for an upgrade upon arrival. Say it nonchalantly, as though you weren’t desperately hoping to have a sunken bath experience where you can kick off your heels in wild abandon. You will be amazed–amazed–how many upgrades I have had with a simple, polite request to my hosts. 5. Don’t hesitate to call the Front Desk. Don’t be afraid to ask for more towels or water or whatever you need. Be kind and gracious of course, because you want to be a good guest. 6.. Ask for a room above the 9th floor. I have unscientifically decided that the sound threshold is usually the 9th floor. Anything below that and you might be woken by couples fighting in the alley below you after a late night party. 7. See if there are add-ons for breakfast or dinner that are less expensive if booked at the time of your reservation. Then, see if you can have them delivered to your room instead. I don’t understand why someone would go out when you can have room service? Well, for breakfast anyway. 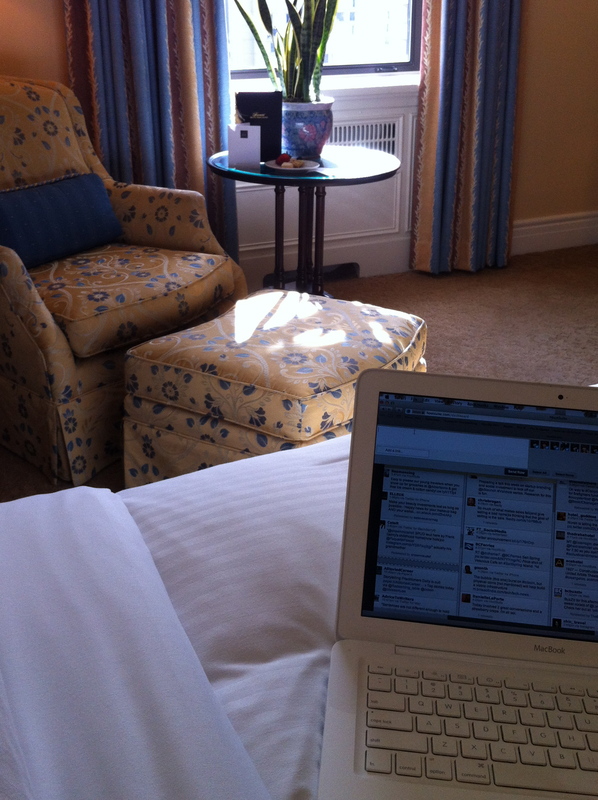 Coffee amidst white sheets, a New York Times, and fresh strawberries–you get the picture. Heaven on earth. 8. If you want to venture out, be sure to have a good face-to-face chat with the Concierge. They are everything when it comes to making plans. I can’t imagine venturing out in a new city without help from the concierge office. If your husband or partner is one of those types who can ‘do it all on his own’, make some excuse to leave the room and go speak to the concierge. Trust me on this. They know more than any man or woman in that hotel about their city. 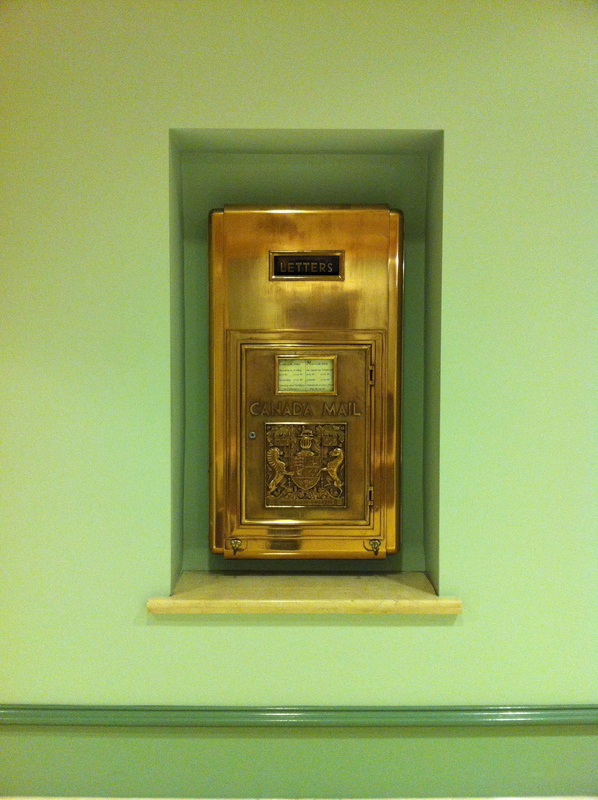 A holdover from the Canadian Pacific days, a beautiful brass mail box. So, if you want to escape from the world, I say, go to a nice hotel. Even if only for a night. And go alone. Really. It’s wonderful. I personally prefer older hotels with a lot of character and history over newer ones. There’s something about the stories that make me feel part of a grand tradition of guests holidaying. 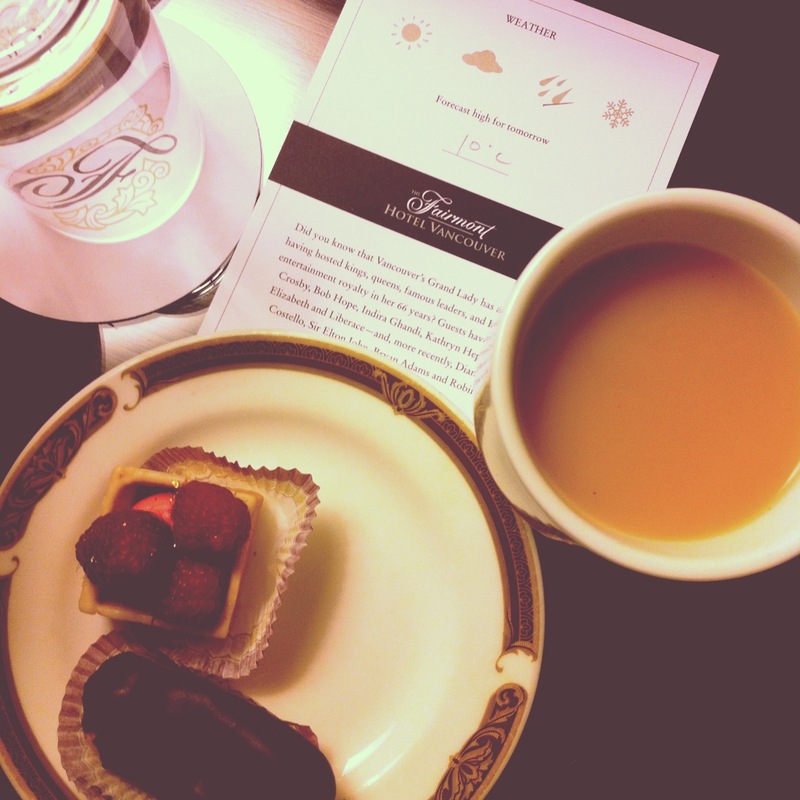 I live for turndown service and late night dessert. There’s something about knowing my hosts are there for me if I need them but otherwise I’m cocooned in my own world of words for the duration of my stay. One day, I hope I can live in a hotel a la Coco Chanel.